Includes 12 Glow in the Dark Cross Necklaces. 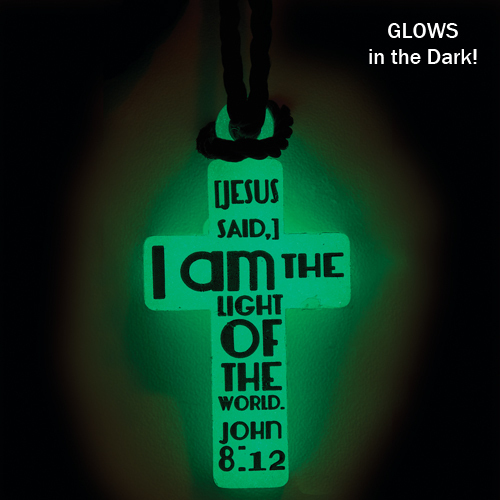 Glow-in-the-dark necklace features Bible verse John 8:12, Jesus said I am the light of the world. 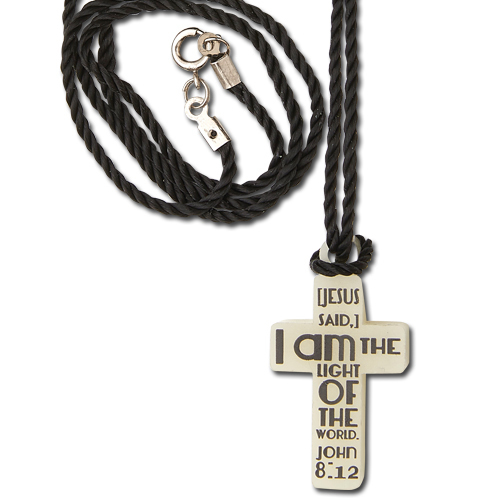 Youth, chldren, and adults will all enjoy wearing this necklace to share the good news of Jesus. Recommended for ages 4+. Contains small parts, not suitable for children under 3. Product Specifications: Cord is approximately 30" long. Glow-in-the-dark cross is 1-1/2" tall. Glow in the Dark Cross Necklace Pack of 12 was published by Eden bundles in September 2015 and is our 9744th best seller. The ISBN for Glow in the Dark Cross Necklace Pack of 12 is EDENBUNDLE-1664. Be the first to review Glow in the Dark Cross Necklace Pack of 12! Got a question? No problem! Just click here to ask us about Glow in the Dark Cross Necklace Pack of 12.